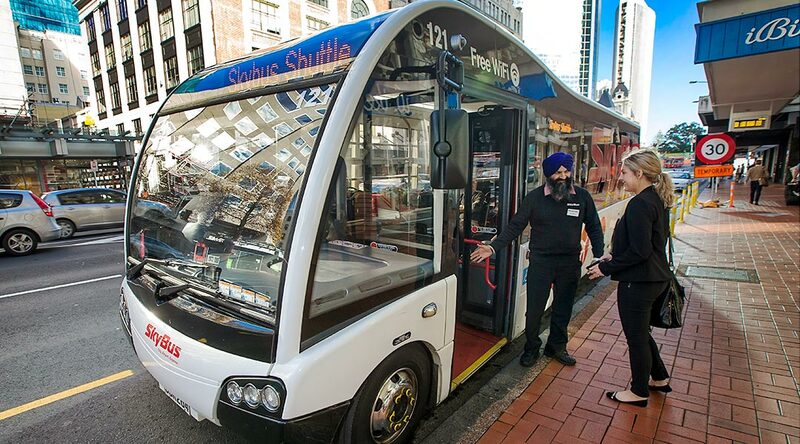 This fast and free shuttle service provides quick and agile access to downtown Auckland for City Express passengers with departures every 10 minutes. The SkyBus connecting shuttle will transport you between our downtown Auckland stops and the SkyBus City Lounge – at no additional charge. The service operates during peak times from 12:00 – 19:00 Monday to Friday. Outside these hours the downtown stops are serviced by the Auckland City Express bus. The SkyBus connecting shuttle links with our Airport service during peak times providing passengers the fastest route downtown. Auckland is a dynamic and rapidly growing city with a number of exciting infrastructure projects underway. The SkyBus connecting shuttle is a quick and agile service designed to accommodate traffic disruptions, road closures and diversions. The shuttle operates from our City Lounge where passengers can relax in comfort enjoying free WiFi while observing flight information from our live Airport feed. How do I use the SkyBus connecting shuttle? Catching the SkyBus connecting shuttle is just like the Airport Express service – simply turn up to your stop and hail the driver. Present your SkyBus Airport Express service ticket when boarding. Simply board one of our modern fleet of shuttle buses from our Custom Street East or 21 Wellesley St West stops in downtown Auckland. The SkyBus connecting shuttle will transport you quickly to the SkyBus City Lounge at 396 Queen Street where you will transfer on to the Express bus to Auckland Airport (AKL). Present your Airport Express service ticket when boarding. Upon arrival at the SkyBus City Lounge at 396 Queen Street you may transfer from the Express bus onto our fleet of modern shuttle buses. The SkyBus connecting shuttle stops at five convenient locations situated in downtown Auckland before returning to the SkyBus City Lounge. The Complimentary City Shuttle operates during peak traffic times of 12:00 and 19:00 Monday to Friday. Outside these hours downtown pickups and drop offs are performed by the Express bus.